We created an infographic to help introduce and explain the significance of the largely unknown compounds known as terpenes. Introducing quality and transparent information into a confusing and an unregulated Industry is the mission of CBD hacker. We aim to be the most comprehensive source for the product reviews and other information about CBD. We like to consider ourselves as experts on all things CBD. All of our content is carefully curated and backed by science. CBD is still a new concept for a lot of people and reliable information is sparse. Because of this, there is a lot of confusion and misinformation surrounding the topic. By now, most people are at least somewhat familiar with what CBD is and the potential it has. In contrast terpenes, plant-based aromatic compounds, still leave most people scratching their heads. These compounds distinguish both the scent and taste of different cannabis strains and have health implications of their own. Understanding what terpenes are will allow people to make more informed decisions when purchasing and using CBD. 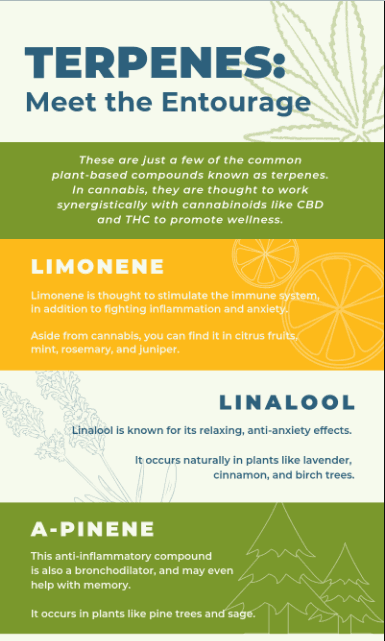 This infographic focuses on what the most common terpenes are and where they can be found.